From Nir Gelband, our new dealer in Israel. Yesterday, my friend Forrest and I got a private skibike lesson from Devin Lenz at Winter Park. In short, we had a blast. Neither of us new what to expect. We were surprised at how easy it was to learn the basics of maneuvering around the mountain. Devin started by teaching us how to do a skidded traverse, which is similar to a skidded traverse on skis or snowboards. 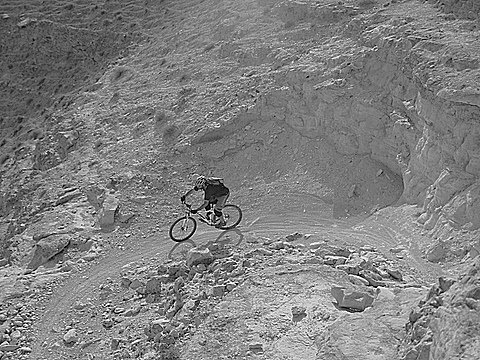 The trick with the ski bike is all in the way you tilt the handlebars. We found out pretty quickly that if you lean uphill, the edges dig in and you accelerate into a carve. Tilting the handlebar downhill, so you can feel the seat touching your downhill leg, flattens out the skis and the bike goes into a nice controlled skid. This was clearly an essential technique to learn before anything else. We also learned that the body position is very important. Once we were doing skidded traverses in both directions, we advanced to “garland” turns, where you start in a skidded traverse, then let the bike go down the fall line and then turn it back to the skidded traverse in the same direction. After doing garlands in both directions, we were pretty much able to connect turns all the way down on the first run. Pretty sweet. After a couple practice runs, Devin started teaching us some more adavanced skills, including sliding the bike sideways down the fall line into a smooth gradual “hockey stop”. 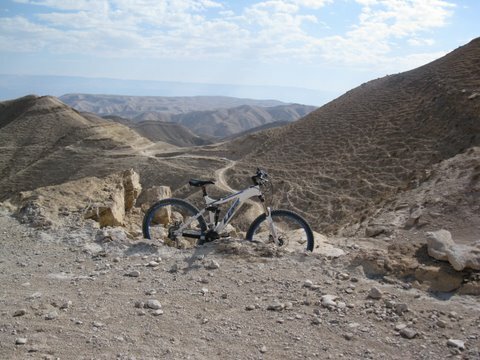 This was a little difficult at first, because the bike wants to go into a traverse. Once we learned the proper body position and bar tilt, we were able to do it pretty decently. Some more practice runs got us learning how to carve the bike, while remaining in control. We were impressed by how well the bike held an edge with so little effort. 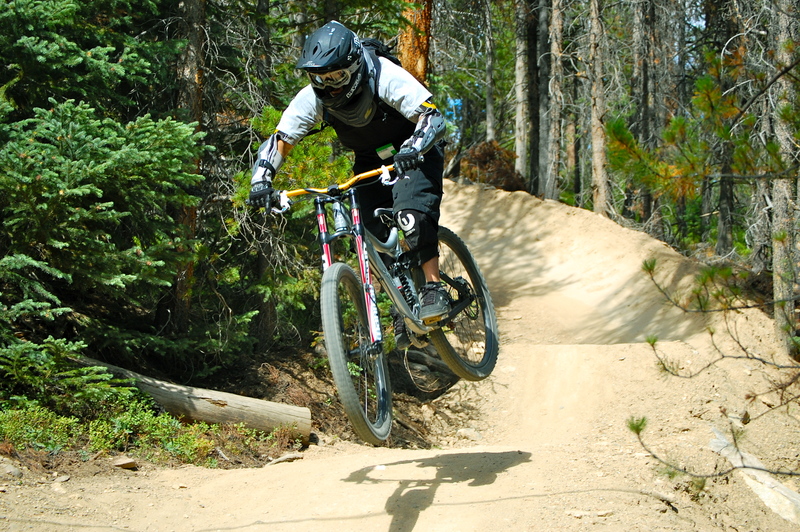 Literally just leaning in the direction of your turn sends the bike into a smooth fast carve. 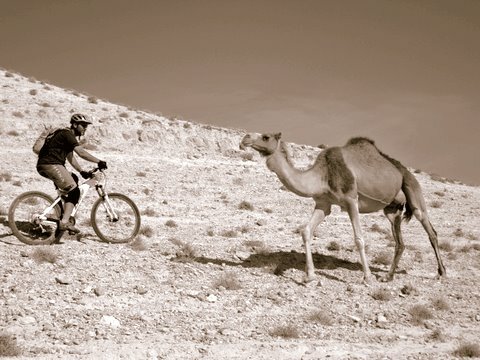 When you’re ready to slow down, we just tilt the handle bar down hill a little, and the bike skids to slow down. Once you’re better, you can just carve back and forth like on skis. The level of control we had at high speeds was incredible. Then it was over to Mary Jane to hit the steeps. We rode through trees and moguls, all on our first day. Steep terrain was challenging, but fun. We were determined to get better. Before we knew it, Forrest was styling moguls and hitting jumps and drops. And I bet he’s still smiling now, while sitting in his office. After three seasons of riding and progressing on the Alpine Brawler, I was pleasantly suprised when Devin Lenz, the owner of Lenz Sport told me he was introducing a new model for the 2010-2011 ski season. He showed me the plans at the end of the winter in 2010. Devin knew I’d be going to the Camp of Champions in July 2010 to ride on what is arguably the best terrain park in the world at any time of year. A week before I left he called me up and asked that I take a prototype up with me for the summer session. I was more than happy to do so and these are my intitial thoughts on the latest skibike design from Lenz Sport. Let me start out by stating that the geometry on the Alpine Brawler and the new Launch model are basically identical. I love the way the Alpine Brawler handles. After 4 plus years of testing before it was released, the geometry is spot on and the large moto style seat allows for new riders to easily pinch the seat and use their legs to lean the bike when initiating turns and stops. The larger seat also allows anyone riding the Brawler model to sit comfortably and cruise down the mountain with a style that relates directly to downhill mountainbiking. Coming from a freestyle background, I was somewhat craving a bike that looked and felt a bit more like my dirt jumper and slopestyle bikes. He delivered with the Launch. The Launch weighs in at 3-4 lbs lighter than the Brawler depending upon how it’s built up. It rides almost exactly the same as the Brawler when the same fork and shock are used on the frames. The difference in feel comes when you do things like 360’s and tailwhips where having a lighter swing weight allows for easier handling. I felt immediately comfortable on the Launch and continued to make progress while up at Whistler over the summer. Here are some of the standout features of the Launch. It’s lighter weight makes it easier to jump and do tricks. The adjustability of the seat allows you to slam it for jump sessions or ride it higher for cruising or backcountry powder days when you need to be able to use the inside of your knees to push and grip the bike. I have not yet ridden the Launch with an 8in travel downhill fork but I’m guessing it will handle just like the Brawler. I like that fact that you can put a remote reservoir shock on Launch where you cannot do so on the Brawler. You don’t really need a reservoir shock because it’s cold and you don’t get shock fade in the winter riding these bikes but I do like having the latest and greatest valving technology at my fingertips. Please check back for more in-depth reviews of the Alpine Brawler and Launch skibikes. 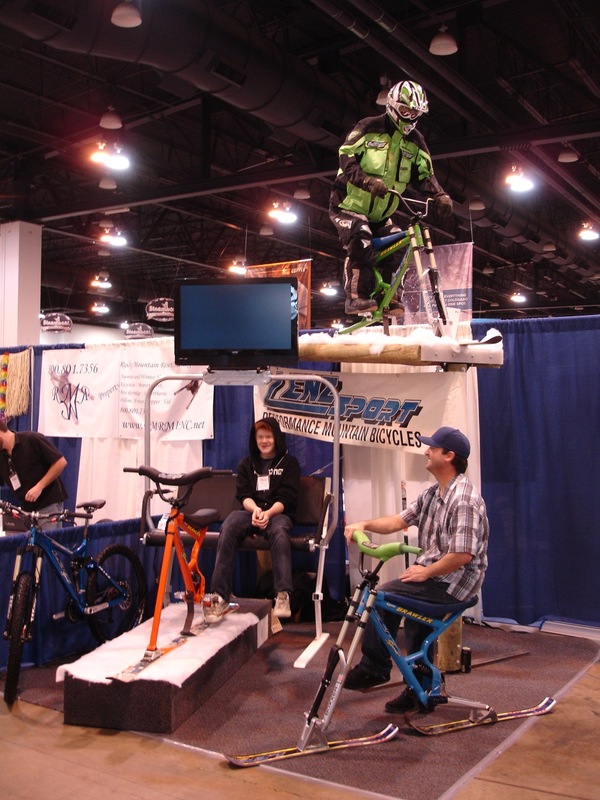 Come visit our booth at the Colorado Ski and Snowboard Expo. The dates are November 5-7 at the Colorado Convention Center. We’ll be exhibiting the full Lenz ski bike line up including the new Launch Freestyle ski bike and the new Rumbler. 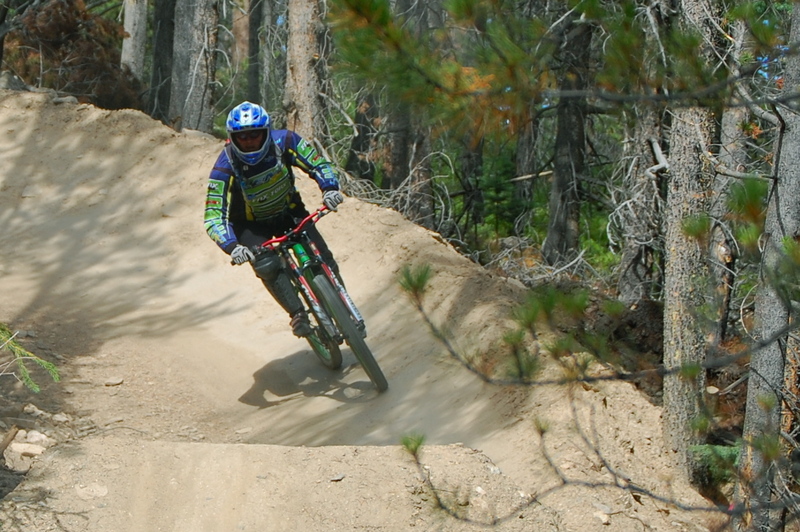 Now that I’m home after riding a PBJ at Winter Park all day, I can’t stop thinking about ripping around those berms. This was my first time on a downhill bike, and my first time at such a cool bike park. 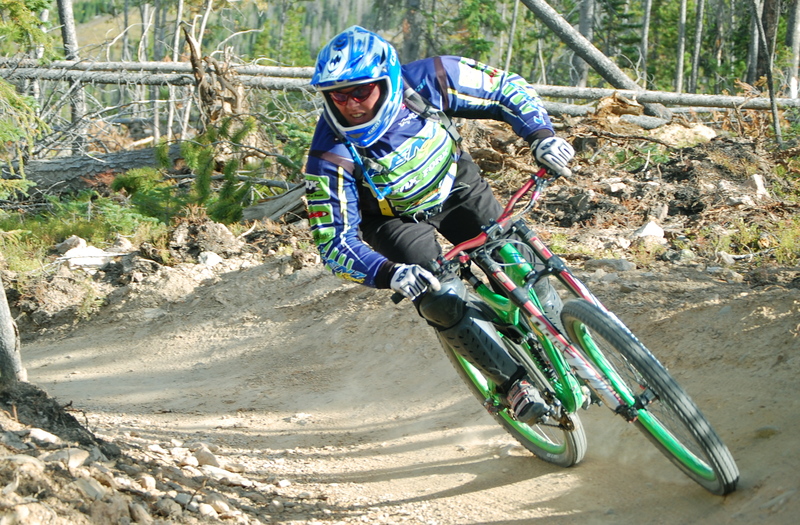 At first the berms seemed big, but after following Devin and Brandon, I got the hang of it. On the PBJ, they just came naturally. I was lucky to be able to follow these guys for my first park experience. It was a lot of fun, and these bikes freakin rip. Everyone asks about the 29er park bikes, of course, since they are the only ones. Do they handle turns okay, do they handle technical okay, blah blah blah. 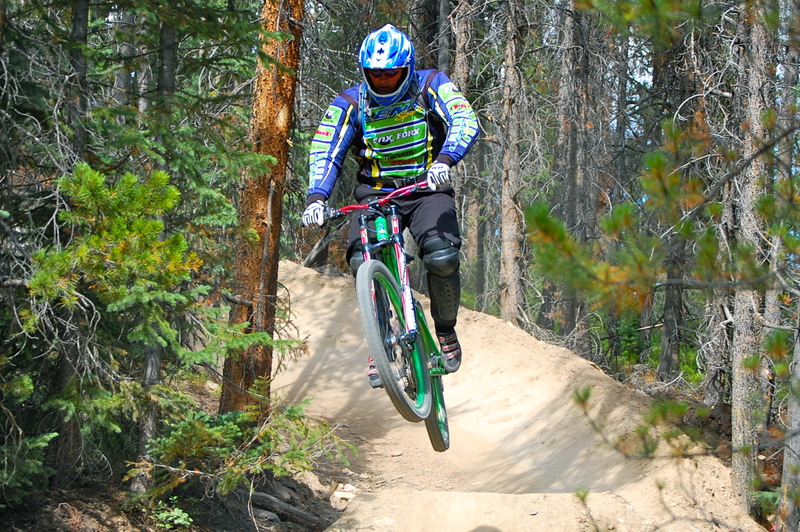 All I have to say is, come and ride a PBJ, and you’ll never go back to your 26 inch wheeled DH bikes again. They handle everything, they are nimble, maneuverable, stable, and really, really, fast. As with all Lenz bikes, the PBJ boasts one of the shortest wheelbases of any 29er out there. With Devin’s 17’5″ chainstay, you won’t complain about the maneuverability. If you want to come and ride one of these bikes at winter park, contact us. They are open weekends in september. come and get some before it starts snowing. Then it’s time to check out the ski bikes! Lenz PBJ DH29er Video at winter park. Sick!! Hey everyone. 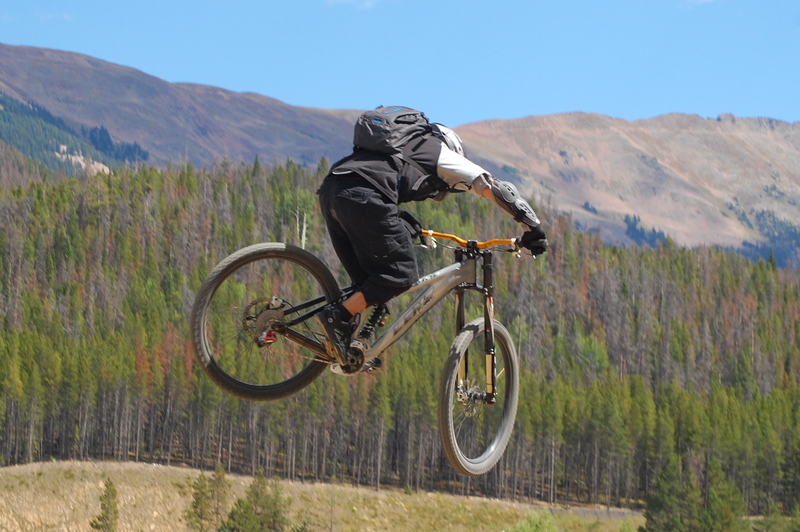 Check out Mike Curiak’s video from the team riding at Winter Park last week on PBJ DH 29ers. 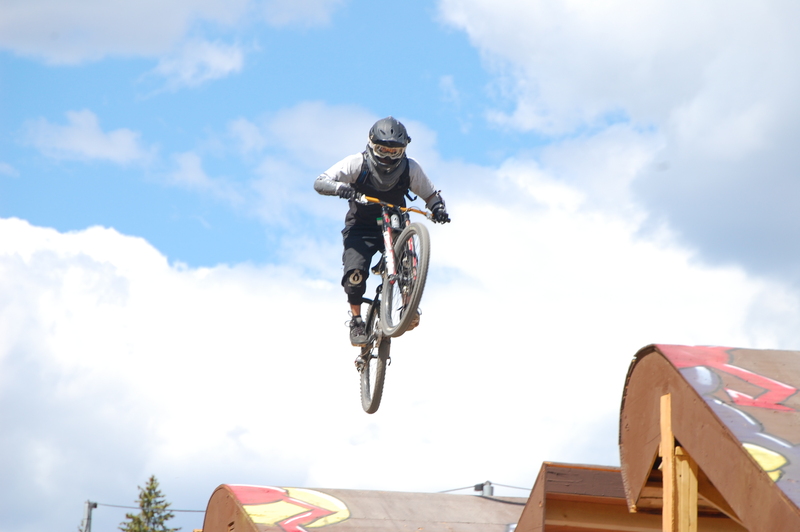 These bikes are so much fun, and winter park’s terrain is killer. Check it out. Too damn fun. No! Not enough fun!! from lacemine29 on Vimeo. My wife Nicole has been loving her new Revelation that she got this spring. While she’s not a racer, she likes to ride a lot. This bike has enabled her to ride things she never thought she could. It’s nice and light, and very nimble for her to climb up and descend the technical front range trails.